We were supposed to be spending Christmas Day & Boxing Day with our good friends Carol & Ted in Leicester, but they both caught bad colds/flu so it was sadly decided that although it would be nice to share the festivities with them we weren’t so keen to share their bugs, so we have spent out first boating Christmas on our boat. As Christmas morning came we opened our presents and the initial disappointment at the enforced change of plans was soon dispelled by an invitation to a Christmas walk so Joy set off with five friends and three dogs through the woods and across the fields leaving ‘the invalid’ back at the boat and returning with the rather splendid snow-scenes below on her camera. When they returned we all went and enjoyed a Christmas drink at The Boat Inn and spent a good time together enjoying their roaring fire. There’s been a further sprinkling of snow today so have stayed in the warm so far today. Yesterday, after a foray to Sainsburys on still snow-covered roads, we decided that ‘discretion was the better part of valour’ and forewent our Sunday church service and even our church Christmas meal in the evening having to content ourselves with visits to Annie’s Tearoom & The Boat Inn instead. When we ventured out we discovered that the neighbours have started to build an igloo, do then know something we don’t? Whatever the reason there were plenty of photo opportunities which we share with you. 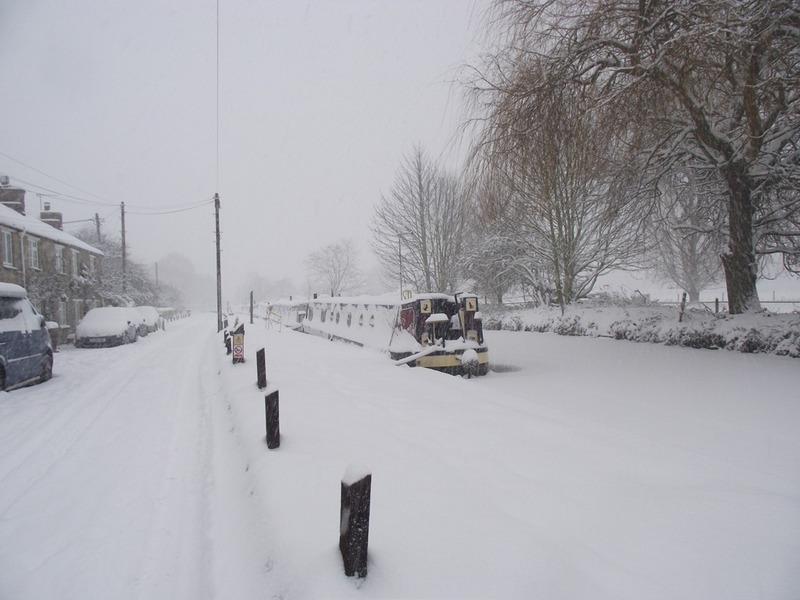 The snow has officially arrived at Thrupp accompanied by two of our grandchildren who arrived just as it started to fall heavily on Friday. Our son was able to borrow a kind friend’s 4×4 and they spent the night with us before celebrating an ‘Early Christmas’ by opening presents on our bed as we won’t see them on Christmas Day. They headed back to Gloucestershire Saturday afternoon and arrived back safely after some delay on the A40 and helping a Polish lorry driver by towing him up a hill!!! I had a dentist appointment midday Friday and made my way to Bloxham Dental Practice through the beginnings of the snow which slowed the traffic to 20mph. I arrived in time to have three teeth extracted and a plate fitted to replace them. Now I know I’m old, false teeth and a dentist who’s nearly young enough to be my grand-daughter! … I blame the grandkids! 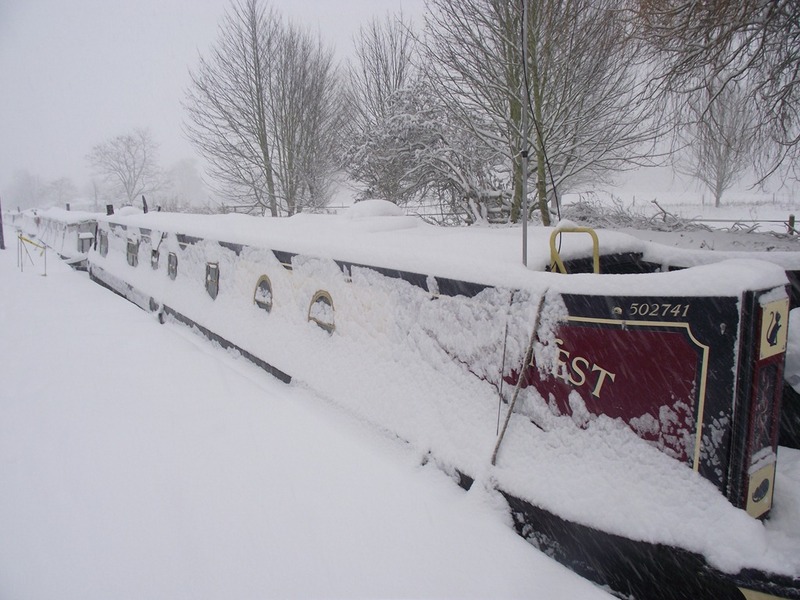 Our intrepid coalman Mark Boardman (aka Dusty) arrived today after breaking his way through the ice to supply us boaters with coal, gas & diesel. He told us that it had taken 14 days to do the trip that usually takes him 4! He really deserves our thanks for not only delivering our fuel but clearing the canal as several boats, who had been stuck in the ice, followed him down. 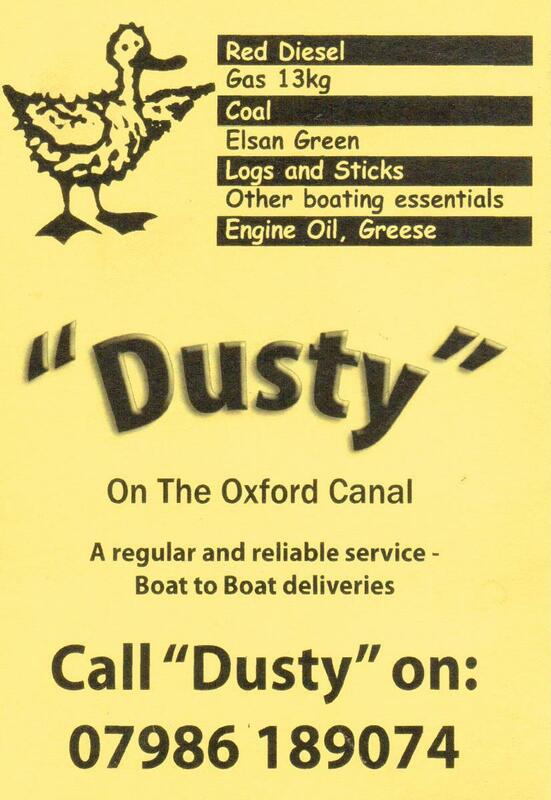 Thanks are due too to David Dare of Oxfordshire Narrowboats who also went icebreaking towards Banbury to meet Dusty. John Sloan Has some video on his blog! No… No… Not Gay Carols, but carols at St Giles’ church Hampton Gay! 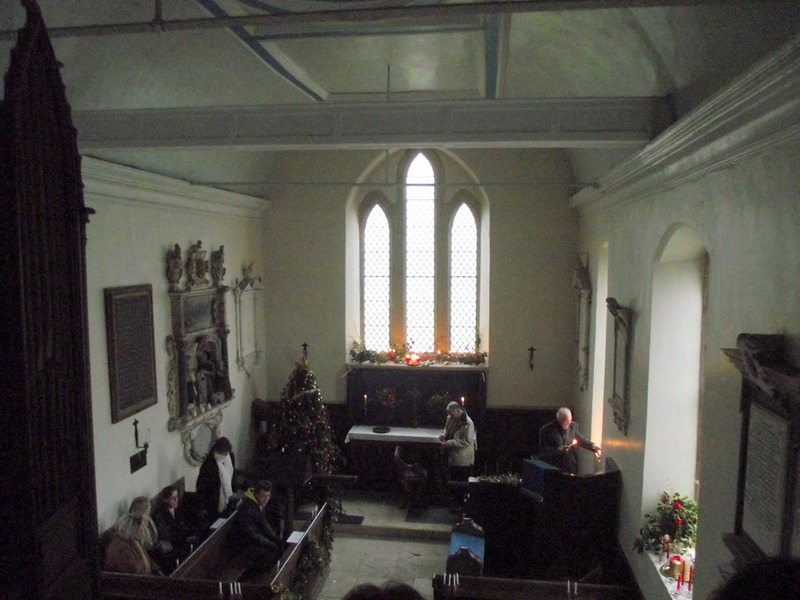 We were invited to join some friends for the walk across the fields to this quaint little church which stands on its own, without electricity, road access or any other modern nonsense, for their service of nine lessons and carols. By the way the name "Gay" comes from the de Gay family, who were the twelfth century Lords of the Manor. Despite being rarely used the church is well maintained and has a gallery at it’s west end with three rows of seats, where we sat, it also houses a barrel organ! The church was packed and looked beautiful in the candlelight and the music was courtesy of an harmonium. History and more photos here. 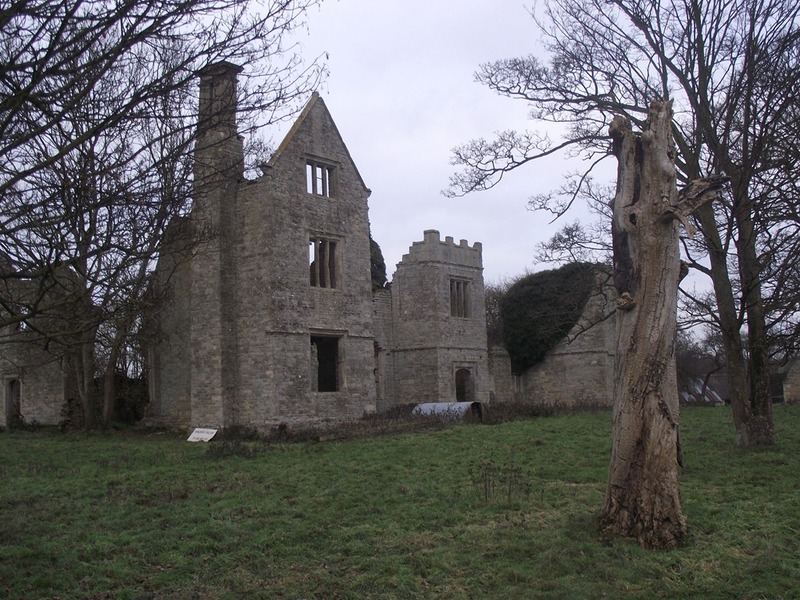 Hampton Gay is an almost deserted village, near where we are moored at Thrupp, having fallen into decline following a disastrous fire which destroyed the village manor house in 1887. The village had more than its fair share of disasters for on Christmas Eve, 1874, there was a tragic railway accident in which thirty-four people died, including two children and 64 were injured when the train left the tracks and plunged into the Oxford Canal below. 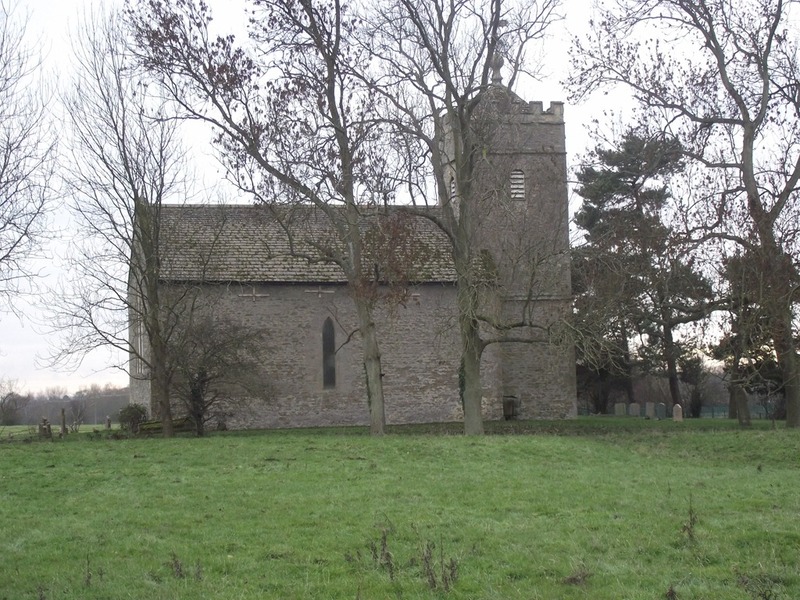 Some of the victims are buried in the churchyard and soon after the nearby mill where some of the survivors were taken was itself destroyed by fire in 1875. More details here. 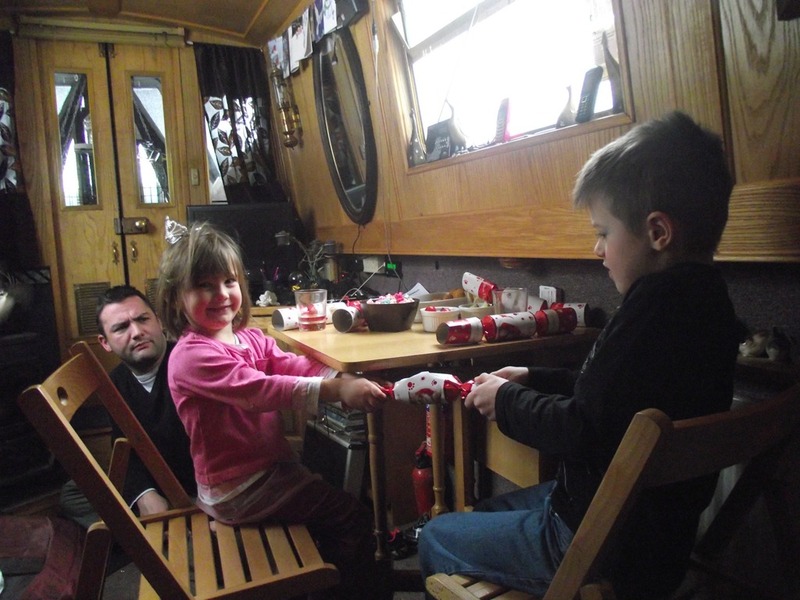 We had a wonderful time and our friends came back to the boat for drinks and mince pies etc. and some stayed and joined us for an evening meal. Our Morsø Squirrel stove has been a godsend during these chilly days, so good that we haven’t needed to supplement it with our gas central heating, even in sub-zero temperatures. We can keep a kettle hot on the top and have even managed to cook stews and casseroles on top of it once we’ve got them up to temperature on the gas stove. So needless to say we had to give it a try today. For lunch it was a Greek theme; Roast Feta cheese with onion, tomato, peppers & olives all wrapped in foil parcels and cooked in the (fairly clean) ashpan for 15-20 minutes, accompanied with courgette slices in a beer batter with a yogurt and mint dip… Yummy! Tonight’s tea was the remains of yesterday’s beef cobbler, topped with puff pastry and made into pies (cooked them in the gas oven) and you guessed it Jacket Potatoes á la Fi… Delicious! … and for supper… Roast Chestnuts, again cooked in a foil tray in the ashpan beneath the fire, another success even if it did take us ten minutes to realise that the explosion which occurred during X-Factor had signalled that the chestnuts were ready, Doh! We are now rounding the evening off by testing the Sloe Gin which we made a few months ago… Hic! Aren’t we getting properly self-sufficient? I always did like The Good Life or maybe that was just because of Felicity Kendall? I’ll leave you to guess. 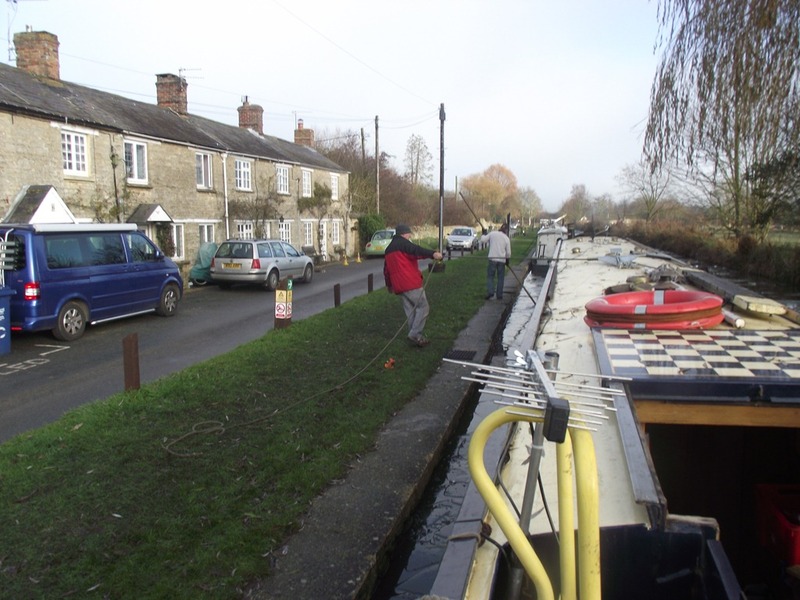 I’ve just worked out that we’ll have been here at Thrupp for four weeks tomorrow which is just a bit ironic since we’ve paid for a winter mooring at Heyford! We managed to get down through the ice broken by the mad Scotsmen as far as the sanitary station for a pump out but found the water taps frozen up. 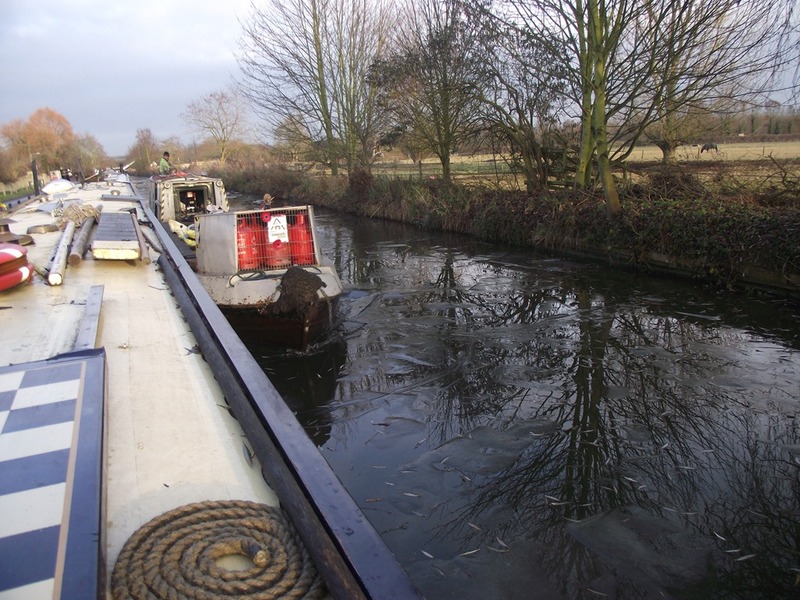 Mike, the Thrupp Canal Cruising Club warden said he would put a heater in the toilet overnight and we would be able to fill up the next day, so we backed up to the 48 hour moorings near the pub and there we were, stuck, as it froze over again that night. Last weekend it was just a bit warmer and nb Lucky did some icebreaking and we followed in their wake the next day and managed to fill up with water. Hooray, a rest from carrying containers back from the tap, but not for long as we are frozen in again. This morning there had been some thaw it was deceptive as the ice was still there under the surface water. 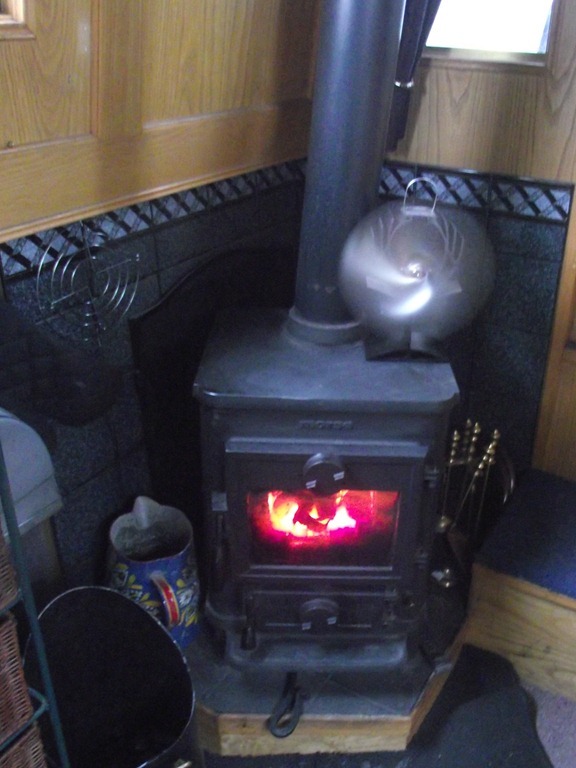 But not to worry we’re keeping cosy with our Squirrel stove working well, supplies of coal on board and a couple of kind friends from church are keeping us supplied with stocks of wood.